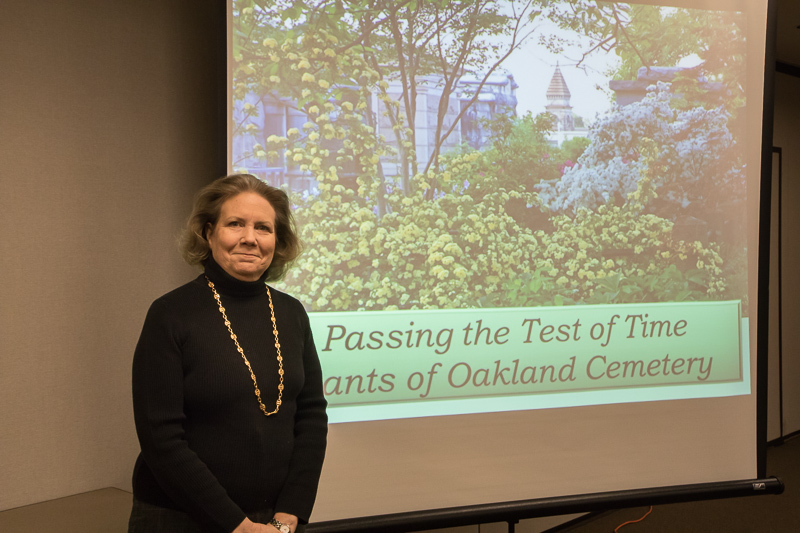 Our noon meeting at Bethesda Senior Center on February 15th featured Sara Henderson‘s presentation Everything Old Is New Again: The Gardens of Oakland Cemetery. Sara is the current Director of Gardens at Atlanta’s Oakland Cemetery. Today’s gardens call for environmentally sensible choices in order to meet modern challenges, but many of the answers are found in historic gardens and heirloom plants. Oakland’s gardens are a laboratory for durability, requiring plants that are durable and low maintenance, yet beautiful in all seasons. These tough survivors often have surprising histories that run deeper than we think. Sara shared beautiful pictures of the many heirloom plants at Oakland and gave those attending an new perspective on adding these plants to our own gardens.